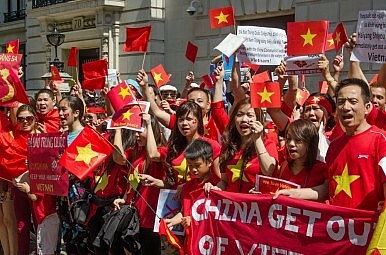 Protesters during the 2014 China-Vietnam oil rig dispute. With Chinese President Xi Jinping in Hanoi, Beijing wants to prove the China-Vietnam relationship is back on track. Still, both Hanoi and Beijing have worked hard to send more positive messages, resulting in a flurry of bilateral visits since summer 2014: Chinese State Councilor Yang Jiechi and Vietnamese Deputy Prime Minister Pham Binh Minh exchanged visits in June 2014 and 2015; Yu Zhengsheng, member of the CCP Politburo Standing Committee and chairman of the National Committee of the Chinese People’s Political Consultative Council, visited Hanoi in December 2014; and General Secretary Trong traveled to Beijing in April 2015. Xi’s visit to Vietnam this week is the culmination of Vietnam and China’s attempt to keep their relationship moving forward, even as tensions over the South China Sea remain unresolved. Chinese media is attempting to paint a rosy of picture of the relationship, as exemplified by Xinhua: “After a wave of tensions caused by their South China Sea row, China and Vietnam are walking out of the woods.” Xi certainly received a warm reception: a 21-gun salute during his welcome ceremony at the Presidential Palace. But the truth is that the relationship remains troubled – in part because of political in-fighting within Vietnam’s leadership. As Carl Thayer outlined for The Diplomat in early October, the two main candidates for the post of the CPV’s secretary general – Sang and Dung – are jockeying for position, which is in part shaping more robust outreach to the United States as a counter to China’s perceived aggression in the South China Sea. With nationalist sentiments in Vietnam still running high (as seen in the handful of protests against Xi’s visit), it’s good domestic politics for Vietnam’s leadership contenders not to get too cozy with China. China and Vietnam addressed the elephant in the room. Xi told Dung that both sides “needed to manage disagreements well, using consultations to maintain (and) preserve stability on the seas,” according to Reuters. Trong, meanwhile, told Xi that both sides should maintain the status quo in the region and avoid taking actions that could complicate the disputes. As part of that, he said both sides should not militarize the East Sea (Vietnam’s term for the South China Sea) and that Vietnam and China should seek the rapid conclusion of a Code of Conduct in the South China Sea (currently being discussed by China and the ASEAN member states). But the two sides also sought to demonstrate that their relationship goes beyond maritime disputes. Vietnam News Agency emphasized the healthy trade relationship between the two countries, saying total trade in the first nine months of 2015 was at $49 billion, up 16 percent over the same period in 2014. China and Vietnam signed 12 bilateral agreements during Xi’s visit, including deals that will see China provide preferential loans worth over half a billion U.S. dollars to construct a highway and railway in Vietnam. China pledged one billion RMB ($157 million) “for the building of social welfare facilities such as schools and hospitals,” according to Thanh Nien News.